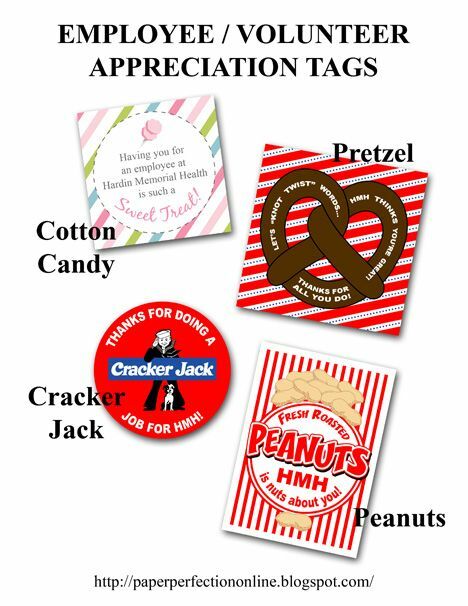 I love making employee appreciation tags and I often receive requests for new tags even though I currently have over 60 tags. I've worked with Hardin Memorial Health for their last employee appreciation event, and they contacted me for their upcoming event in June. They are going to have a baseball theme and wanted a tag for pretzels, fresh roasted peanuts, cotton candy and cracker jacks. Perfect for the baseball "Take Me Out To the Ballpark" song where it says, "buy me some peanuts and cracker jack." Here are the tags I created for them.